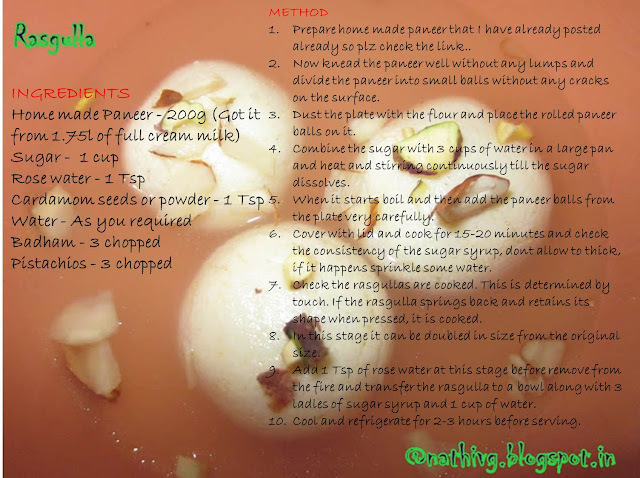 Rasgulla is a cheese-based syrupy sweet dish originally from the Indian state of Orissa. It is popular throughout India and other parts of South Asia. The dish is made from ball shaped dumplings of Chenna(an Indian cottage cheese) and semolina dough, cooked in light syrup made of sugar. This is done until the syrup permeates the dumplings. There are many variations in making rasgulla, they are usually served at room temperature or colder. A popular variant in Orissa and Bengal is freshly prepared hot rasgullas. Here I prepared in the style of Northern India, the dish comes with flavored in saffron, rosewater and sometimes garnished with chopped almonds and pistachios. A serving of rasgulla has a total of about 186 calories. A serving of rasgulla provides about 9% of the total daily calorie requirement for a standard diet of 2,000 calories. 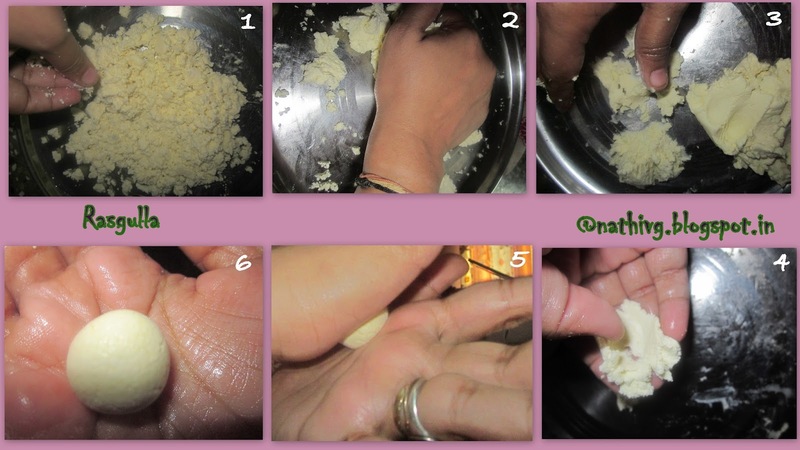 Prepare home made paneer that I have already posted already so plz check the link..
Now knead the paneer well without any lumps and divide the paneer into small balls without any cracks on the surface. Dust the plate with the flour and place the rolled paneer balls on it. Combine the sugar with 3 cups of water in a large pan and heat and stirring continuously till the sugar dissolves. When it starts boil and then add the paneer balls from the plate very carefully. Cover with lid and cook for 15-20 minutes and check the consistency of the sugar syrup, dont allow to thick, if it happens sprinkle some water. Check the rasgullas are cooked. This is determined by touch. 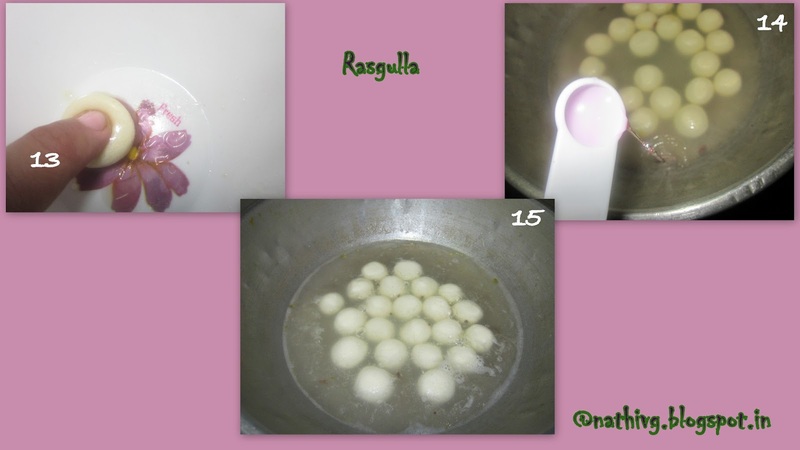 If the rasgulla springs back and retains its shape when pressed, it is cooked. In this stage it can be doubled in size from the original size. Add 1 Tsp of rose water at this stage before remove from the fire and transfer the rasgulla to a bowl along with 3 ladles of sugar syrup and 1 cup of water. Can u see the sponginess of rasgulla!!! Rasgulla should always be cooked on a very high flame. While making balls ensure that there are no cracks on the surface of the shapes. Make sure you sprinkle a little water at a time by hands and not large quantities. The cooking time of the rasgullas will vary depending on their size. yummy rasgullas sis.am also follow open pot method and that tastes super good.instead of pressure cooker,this is best. Hi Viji, rasagullas look lovely. I love it, but have never tried this at home. Wow picture perfect rasagullas!!! very delicious and my fav sweet!!! So tempting...I hardly eat sweet stuffs but I'm drooling for this..
Looks so delicious.. my favorite.. Feel like grabbing it from screen.. yum!! Yummy yummy!!! Want to taste this now...tempting viji! Love these when chilled. Awesome one. I luv this with less sugar. I have try my hands on this soon. Looks so tempting esp. the last pic. 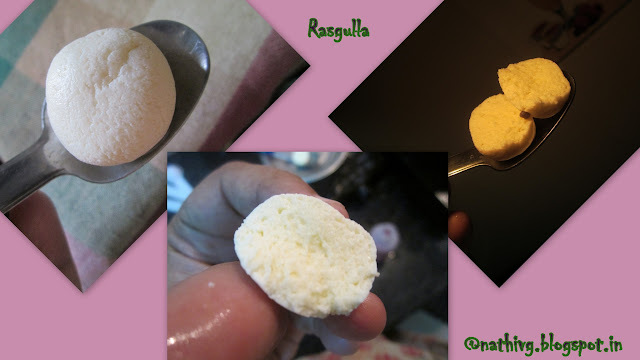 Spongy and juicy rasgullas are always my fav..
Rasagullas looks so spongy and soft.. lovly!!!! you know rasgulla is my favourite sweet. 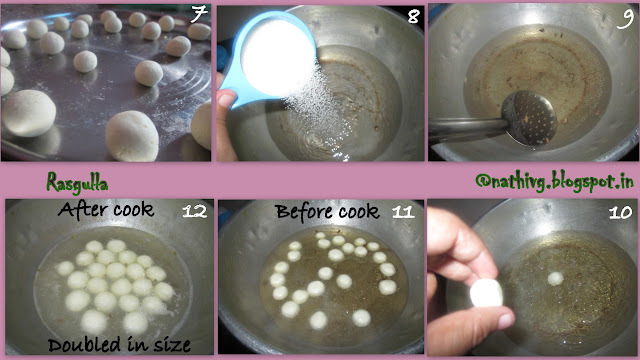 as a Bengali we called it "rosogolla".. :)... and i love that cute recipe card..
Looks delicious and tempting! photograph is lovely! Yumm rasgullas..perfectly made! nice presentation!! huhhh..such a tempting pics dear...running out into kitchen.cant wait to taste dis..great.....nice blog vth tasty recipes..
Nice presentation dear!! I love this ever!! Often I use to do this dessert!!! Easy Dessert too!!!! Well done dear!!! There is no doubt, you are a master chef dear. 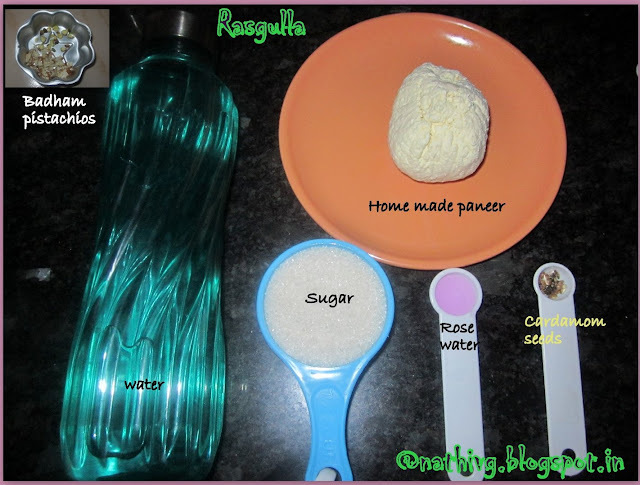 Because making rasgulla is really very tricky. How my younger sister made this wonderful dessert so perfectly!............hats off to your effort. awesome pics :) n spongy looking rasogulla's !! Perfectly made rasgulla, looks awesome dear!